A new study shows teenagers who take an active ingredient in Tylenol may be at increased risk of asthma. (Health.com) -- Teenagers who take acetaminophen -- the active ingredient in Tylenol and many other over-the-counter remedies -- may be at increased risk of asthma and some allergic conditions, according to a new study of more than 320,000 children in 50 countries. Compared with those who never take the popular pain reliever and fever reducer, 13- and 14-year-olds who take acetaminophen at least once a month are 2.5 times more likely to experience asthma symptoms, the study found. Even those who take acetaminophen just once a year are 40 percent more likely to experience symptoms. 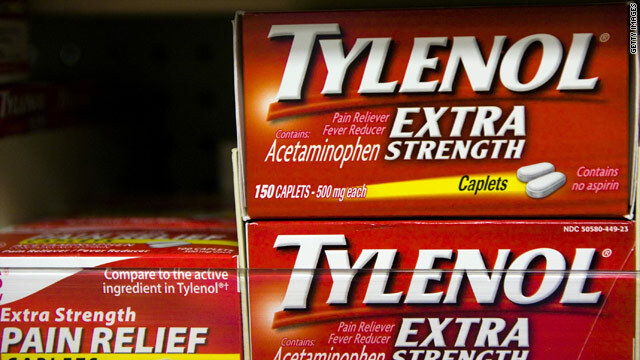 Kids who take acetaminophen may also be at greater risk of certain allergic conditions. Once-a-month users were roughly twice as likely as never users to have eczema, a stuffy nose (rhinitis), and itchy and watery eyes, according to the study, which was published on the website of the American Journal of Respiratory and Critical Care Medicine. The researchers can't say that acetaminophen directly causes asthma and these other conditions, however. That will require long-term studies that compare children who take acetaminophen with a control group, says the lead author of the study, Dr. Richard Beasley, M.D., a professor of medicine at the Medical Research Institute of New Zealand, in Wellington. "Acetaminophen use may increase the risk of asthma, and randomized controlled trials are urgently required," Beasley says. Such trials are already under way, he adds. But Dr. Harold Nelson, M.D., an asthma and allergy expert at National Jewish Health, in Denver, says that it may not be too soon to cut back on acetaminophen use. "The data is so overwhelming that even in [the] absence of a randomized controlled trial, it would be prudent for parents to avoid the use of acetaminophen in their kids," he says. "The evidence has been building for a while, and it is very, very convincing." In 2008, Beasley and his team reported that children who received acetaminophen as infants were more likely than those who didn't to experience asthma and allergic symptoms five to six years later. Overall trends in asthma prevalence also suggest a link between acetaminophen and asthma, Nelson says. "The onset of the so-called asthma epidemic in the U.S. was in 1980, and that is about the time that aspirin was recognized as probable cause for Reyes syndrome," he says, referring to a potentially fatal disease affecting the brain and liver. "Cases of pediatric asthma went up when aspirin use went down." Dr. Neil Schachter, M.D., a professor of pulmonary and community medicine at Mount Sinai Medical Center, in New York City, says that the acetaminophen-asthma link is a chicken-or-egg question. Children with asthma might be more likely to take acetaminophen, rather than vice versa, he points out. "We know that kids with asthma get sick a lot, and they are prescribed a lot of combination medications which contain acetaminophen, so that makes it more likely that children with asthma will use Tylenol in general," he says. The teenagers in the study were simply surveyed about how often they took acetaminophen and their history of asthma, eczema, or other allergy symptoms, so it's possible that medications besides acetaminophen -- or other, unrelated factors -- could explain much of the link seen in the study. Aspirin and non-steroidal anti-inflammatory drugs (NSAIDs) have also been linked to an increased risk of asthma, Schacter says. These drugs can trigger the production of leukotrienes, a naturally occurring chemical substance that promotes an inflammatory response in the lungs. "The implications that aspirin, NSAIDs, and now Tylenol increase asthma risk doesn't leave a whole lot of anti-fever or analgesic drugs to treat children who get sick all the time," he says. "Talk to your doctor or child's pediatrician before making any changes."